Today is Tuesday and the Wildwood sends out a mild warning. The key word of “Struggle” alone is enough to make ones ears prick up, the image just adds dimensions to it. While Arrows in The Wildwood relate to winter time, we’re in July. Though, tell that to Mother Nature, it’s freezing here in the UK! 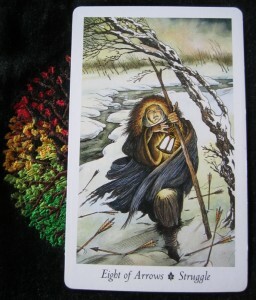 But arrows in this deck relate to thoughts, don’t they? Is there a bad idea going through my head? That’s hard to work out, I usually have lots of ideas in my head, but that’s it: they’re in my head. Alone. However, why struggle on alone? Can I be brave enough and ask for help? The answer is yes, I can and it often helps. Asking others that I trust what their views and opinions are on subjects on which I can trust their judgement and listen to the input helps. The book suggests that we see honestly what the issue will require for me to solve it. I might not be the only one involved in the solution, and if that is the case, present it to those that need it in an implacable and unyielding dedication. I am not sure about the implacable and unyielding dedication part, but I am often quite good at finding solutions to situations and problems. If you’d like my help either privately or in a party situation, you can book your slot or party via this page.